Also, a huge thank you to my sister for coming to my rescue during my time of need and thank you to my brother for taking the photos! 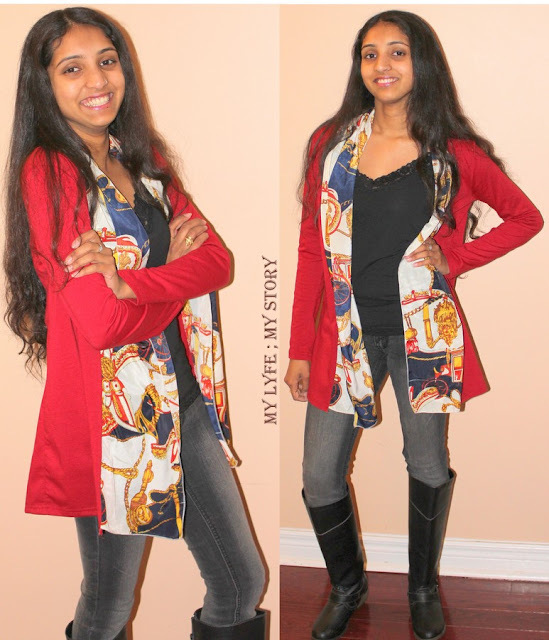 I hope you all enjoyed this "Now Wearing" outfit post! Please feel free to leave you comments/thoughts below and I will definitely get back to you all! and all of you will definitely be seeing more of her in the upcoming future posts. and will end on December 15th. All Christmas orders will come with free gifts, along with free shipping. So adorable and love her smile! The scarf cardigan is amazing! never seen before!! El rojo te sienta fenomenal. oh i love especially the scarf and the boots your beautiful sister is wearing! Love the scarf and your sister has a pretty smile! Love the pairing of the scarf and coat! Very pretty! your time to introduce your sister to us. Definitely a must have for the fall and i think you can where it all year round. It would be perfect for the weather here in Calgary...PS. did it start snowing in Toronto yet? Love the title of this post and the model is so cute. thanks for the comment and love you blog! It's been a while since i commented so wanted to say hello! Hi sweety, hope that you feel better soon...your sister has such dashing style, beautiful look, love the scarf! Gorgeous cardigan, very cute outfit! Your sister is so cute!!! That red is a great color on you!! Love seeing your style,sorry to hear you were under the weather.That silk scarf cardigan is amazing,I love it,two in one! Thanks so much for your lovely comment a little while a go,sorry it toke so long for me to stop by and check out your new posts. Its a scarf and cardigan mixed??? I'm loving it!! !